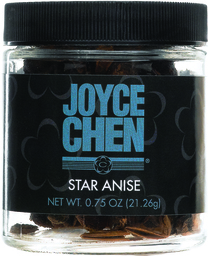 Joyce Chen Sichuan Peppercorn is recommended by Christopher Kimball's Cook's Illustrated, which noted the "pronounced tingling sensation" of our product, and that it "packs a punch." As well, they described it as having "woodsy, clove-like" undertones. These features - citrus and cedar overtones and tingling mouth sensation - make this product a perfect partner with stronger spices in Sichuan dishes. Guy Fieri of the Food Network's show, "Diners, Drive-ins and Dives" has referred to the explosion of sensation that Sichuan Peppercorn makes in your mouth. To enhance the flavor, we recommend that you lightly toast a recipe’s portion in a dry saucepan. Sichuan Peppercorn adds flavor to a variety of recipes, including our Dan Dan Spicy Peanut Sauce. It’s also may used to add a unique flavor to homemade pickles. 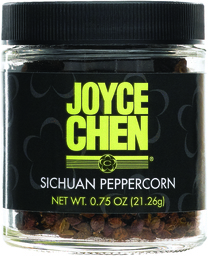 Joyce Chen Sichuan Peppercorn is available online and in stores (see links below). If your local retailer does not carry this product and you would like them to, we recommend that you submit the Store Request Letter (below). In some instances, Sichuan is spelled Szechuan. A small amount of this aromatic mix of fermented soybeans, ginger, orange and other spices adds a savory depth to stir-fry, fish, and ribs, and a variety of classic Chinese recipes, such as green beans in black beans. For use in recipes, either mince or sprinkle into dish while cooking or use as part of cooking sauce. Most recipes ask for a small amount of fermented black beans, so there’s enough in our jar for you to make multiple servings. If desired, this product can be rinsed to reduce saltiness. 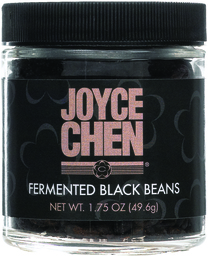 Joyce Chen's recipe for shrimp with pea pods and Tea Eggs are delicious when make with Joyce Chen Fermented Black Beans. 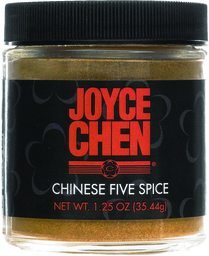 Joyce Chen Chinese Five Spice is a special blend of spices that adds a complex kick of aromatic spiciness and sweetness to roasts, marinades, stews, stir-fry, and even baking. Joyce Chen’s blend is a perfect addition for chicken, rib, and noodle recipes that specifically call for Chinese Five Spice. It’s also a great replacement for cinnamon in your favorite recipe. Our glass pinch jar contains 1.25 ounces of Chinese Five Spice Powder.